The leather strap costs $275, while the steel one is priced at $295. 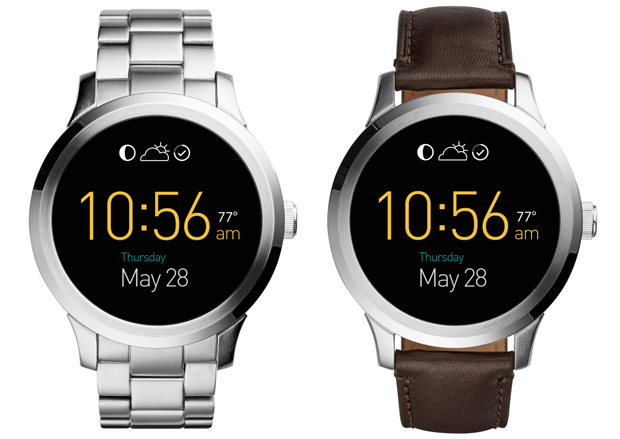 The Fossil Q Founder Android Wear smartwatch is available now for $295 on Google’s Play Store. This is the first official Android Wear smartwatch released by Fossil. The smartwatch gets its juice from an Intel Atom proc, and along with a round display, it offers an elegant, but simple, vibe. Released just a couple of weeks ago, it has now made its way to the official Google Play Store. You can order it right now! The Fossil Q Founder comes in two variants: a light stainless steel case with a leather band, and a light stainless steel case with a steel band. The leather variant isn’t yet available to order, but Google has announced that it will be in the near future – it will cost $275. However, you can order it directly from Fossil. It packs a 1.5-inch OLED circle-shaped display, and it’s capable of outputting a resolution of 360 x 326 – pixel density stands at 240 ppi. Inside the Fossil Q Founder you’ll find an Intel Atom proc with 1 gig of RAM, and 4 gigs of internal storage. Fossil, along with Google, claims that its 400mAh battery can make the smartwatch live for more than 24 hours – that is, under mixed use. It also comes with Bluetooth 4.1 LE, WiFi and a certification for water-resistance – IP67. As any worthwhile smartwatch, you can interchange the strap with other 22mm bands. Given that Fossil is a leader in the watch industry, the Fossil-manufactured smartwatch could very well boost sales for this kind of devices – not only for them, but for Apple and Samsung as well. Fossil is one of the most popular fashion watch brands in the world. There’s only one other brand that sells an Android Wear Intel-powered smartwatch, and that is TAG Hueur. But theirs comes with a hefty price tag of $1,500. However, the Tag Heuer Connected watch is witnessing quite the popularity and the demand has surprised the company. Tag Heuer has announced last week that they have almost doubled production to meet demand. Considering that Fossil’s Q Founder Android Wear smartwatch is immensely less pricey, and it’s also available from a) its own-brand store, and b) from the Google Play Store, Fossil might take the lead. Given that X-Mas is just around the corner, consumers might want to bolster their family’s stocking with a lot of gifts instead of just one expensive device. And to be frank, $295 for an Android Wear smartwatch isn’t that lavish – it’s almost $100 cheaper than the second gen Huawei Watch. The Fossil Q Founder smartwatch is compatible with iOS 8 plus and Android 4.4 plus and Google claims it should ship in 1 to 2 days.